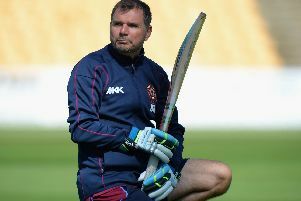 David Ripley rued a missed opportunity for Northants as they were edged out by Worcestershire. Ripley’s men were bowled out for 164 in the second innings as they lost by 20 runs at New Road. But it could all have been so different had Northants been able to take their chances with the bat. They bowled Worcestershire out for 188 on the first day, with debutant Andy Carter taking three for 51. But Worcestershire hit back with the ball, dismissing Northants for just 157, despite 47 from Ben Duckett. Northants tore through Worcestershire on day two, with Nathan Buck claiming four for 42, but the final-wicket pair of Ed Barnard and Josh Tongue put on 45 to take the total to 153. And that proved crucial as the away side were bowled out 21 runs short of the victory total, with Max Holden (37) top scoring. “We are disappointed because we think had three opportunities to get ourselves ahead of the game,” said Ripley, who had steered his side to five consecutive County Championship Division Two victories prior to the defeat at New Road. “At 50 for one on day one, we should have gone past Worcestershire from that position, and their last wicket putting 45 on today, that was a lot in the context of the game. “Otherwise we would have been chasing 140-odd. “Then at 122 for five in our second innings, we believed again that there was an opportunity to go on and win the game. “So we had three good chances to put a good bit daylight between us. But I can’t fault our effort. Worcestershire skipper Joe Leach was the home hero as he took 10 wickets in the match. And Leach said: “It’s hard to describe. All the way through the game the pitch has done quite a bit for the bowlers. So wickets falling frequently was inevitable. “I think it’s hard to be disappointed with the batting, to be honest. I think Northants bowled well again. “The bowling has been high quality all through and I think it’s harsh to put too much blame on batsmen.